Made In America. Some of the best manufacturers still do it, everyday. When you choose to manufacture what were once American made products overseas, it’s a choice that can really impact customers, especially customers who value quality. With overseas manufacturers, often a cheaper price is provided at the cost of quality. There are often much longer shipping timelines (as long as 6 to 8 weeks or more) and a great deal of energy expended in the shipping process to purchase something that is made virtually around the corner. But more so, there is less certainty. Who will you get on the phone when you call customer service? Will they be able to help you quickly as a dealer? Is the product reliable? Will we have the same variety of products and finishes as we do from an American manufacturer like Glaro Inc.? Are the products manufactured in facilities with humane conditions? Are we all doing our part to grow the American economy? There are many questions to ask. Glaro has all the right answers! 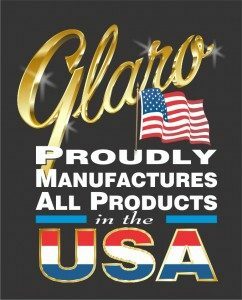 At Glaro Inc., our choice is to support American manufacturing and American jobs. Ensuring certainty and building confidence are key core elements of the brand and always will be. Glaro Inc. is proud to be a leading American manufacturer of waste receptacles, recycling receptacles and dozens of other products lines. We are just as proud to support American jobs and employ all of our staff on American soil since 1945.